Hearing aids are frequently recommended by audiologists for people who have experienced a loss of hearing that is related to tinnitus. When used for alleviating tinnitus, hearing aids are often effective and help an individual hear better at the same time. They may also be used as part of a larger care package as well. Tinnitus refers to issues in hearing where the patient experiences a phantom-type noise in one or both ears. Studies also confirm that tinnitus is a by-product of hearing loss and can be helped by the use of a hearing aid. The clicking, whining or buzzing noises associated with tinnitus can be abated when sound is reintroduced through the insertion of a hearing aid. This type of condition afflicts millions of U.S people and has been recognized by celebrities and entertainers. While there is currently no remedy for tinnitus, there are things you can do to alleviate the malady. Some of the therapies that are used include sound treatments, acoustic stimulation and hearing aids. New research concludes that tinnitus is triggered by a misfiring within the brain, and usually happens because of a loss of hearing. Therefore, hearing aids may play a big role in relieving the condition than what was originally believed. In fact, patients report that they do not notice tinnitus as much when they regularly wear hearing aids. Therefore, tinnitus may not only be brought on by one of the aforementioned conditions but may occur when the brain unsuccessfully tries to repair itself. Therefore, replacing a phantom or false sound with a real sound (or with a hearing aid) can bring relief. Previous studies also show that hearing aids can provide relief for tinnitus because they reinvigorate certain parts of the brain. To wear a hearing aid, a tinnitus patient needs to make sure that the hearing aid fits. Also hearing aids are vulnerable to moisture and wax, although certain makers of hearing aids coat their devices with an invisible waterproof membrane which supplies a good amount of protection. Again, proper fit is a priority; therefore, it is important to work with an audiologist to make sure the device fits properly inside the ear. Also, patients should have their ears regularly checked for wax build-up and have the excess removed. Make sure the wax is removed by an audiologist or nurse as using items, such as cotton buds, can further damage the ear. 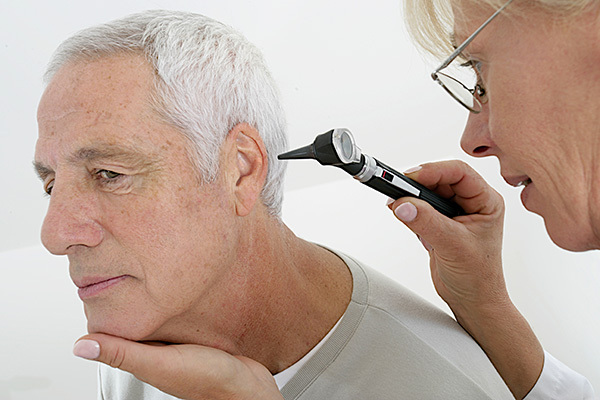 Audiologists often suggest open-fit hearing aids for a slight hearing loss that is exacerbated by tinnitus. Open fit technology is recommended as it can overcome occlusion and reduce external sounds. Once a hearing loss is identified, a hearing test is advised at least once every three years.